The G2 is a gorgeous phone with a brushed steel front and back. It feels very solid when holding it and its 3.7 inch display makes one handed operation a breeze. The signature trackball of the G1 has been replaced with a touchpad. Coming from a Nexus One which has a trackball, I found the touchpad easy to use and it responded well to my thumb movements. The actual use of the phone is great even though the phone has an 800MHz processor. It is a fast phone. The processor has been optimized for this phone and in a speed test run, it performed as good as a 1GHz processor phone or in some cases even better. One thing I do want to mention is that in the time that I have field tested this phone, the battery has performed amazingly well. I have not had issues where half way through my day I need to plug it in to charge it. 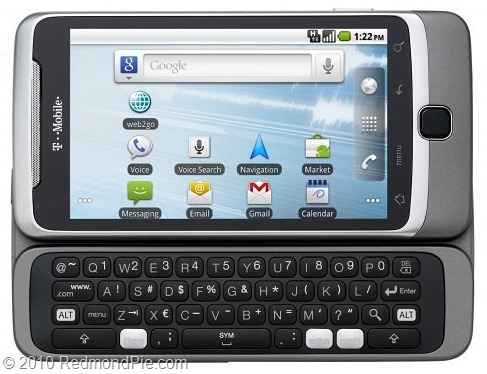 The G2 comes with a slide out physical QWERTY keyboard. The keys are more in line with the keys on a real PC keyboard for a more natural feel when typing. The keyboard also comes with 3 hotkeys that can be programmed as shortcuts for applications. I find the keyboard to be cramped and difficult to type on especially when compared to the keyboard on the Epic 4G. I have not used the phone extensively but in the limited capacity, I found the call quality to be good and have not dropped one call yet. The 5 megapixel camera on the phone takes beautiful pictures with no delay in the auto focus that runs standard on the phone. The video taken with phone is amazing on this phone and I would put it up against any top phone on the market today. All in all the phone performed well, aside from the keyboard being a little cramped. I was impressed with the phone.